Here are 7 must-have tools to keep in mind if you are looking for great garden gifts for your favorite gardener. These compact garden tools feature serrated and straight edges that are perfect for a variety of garden needs, including cutting back weeds at the root. They also feature handy measuring marks, so you know the exact depth when planting and sowing. Get this handy little tool for the gardener who can appreciate a tool that can get the job done! Upgrade your favorite gardener’s glove game with some stylish and comfortable leather gloves. The more your green thumb works in these, the better they’ll fit! These pigskin gloves from Home Depot will last for years. Wildflower mixes can provide season-long color and important forage for bees and butterflies. BBB Seed has a variety of regional and specialty wildflower seed mixes that will make any gardener, novice or expert, smile all season long! Save your friends knees with these waterproof and forgiving knee pads. These knee pads are designed specifically for getting your hands dirty in the backyard. A little costume jewelry can show a personal touch for someone you care about! We love how many cute, garden themed charms, pendants and earrings you can find on Etsy. You can always use new snips. Especially nice ones from Fiskars. Still don’t know what to get someone? Don’t worry about it. 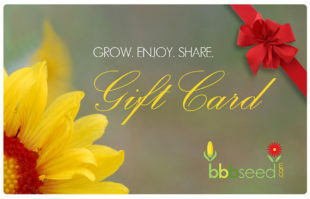 Just get them a gift card to bbbseed.com and they can get whatever they want!